Ram trucks only had to go 3.1 miles to break a Guinness World Record and set a second one for good measure. That was the required distance covered by 451 participants in the Ram Truck Round-Up about a week ago as part of the 2015 Academy of Country Music Awards weekend in Arlington, TX. The Ram Truck Round-Up set the record for longest-ever parade of trucks, breaking the Guinness World Record of 438 pickups (not all from the same manufacturer) set just last year in Vale, OR. But the Round-Up also set an official Guinness World Record for the longest-ever Ram parade. The Ram Round-Up outside AT&T Stadium. 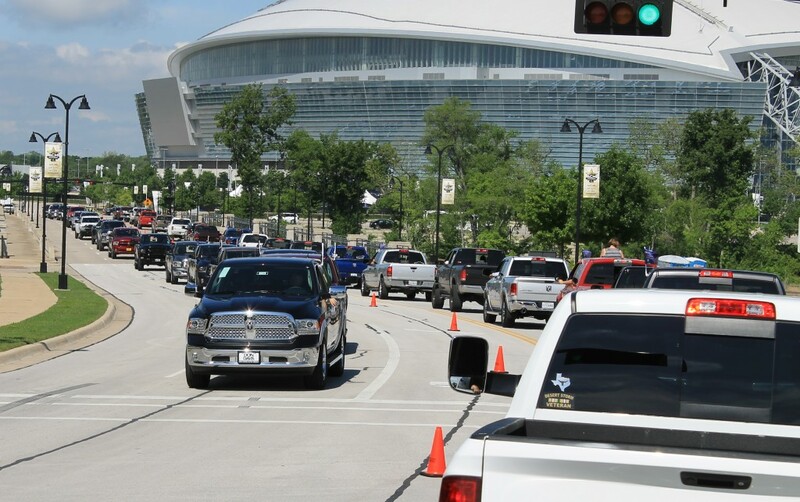 “It’s a sea of Ram trucks,” reported one participant while waiting for the parade, which traveled around AT&T Stadium, home of the Dallas Cowboys, and Globe Life Park, home of the Texas Rangers. RELATED: Ram Trucks gunning for Guinness World Record at charity event in Texas and Making history at the ACMs, a first-person account of the Ram Truck Round-Up. “Ram truck owners from seven U.S. states and Canada helped the Ram Truck brand set a new Guinness World Records title for the largest parade of pickup trucks,” Ram announced in a press release. More Texans drive pickup trucks than any other state, according to the Ram press release, 20 percent of motor vehicle registrations versus the national average of 12 percent. Ram sells twice as many trucks in Texas as in any other state, according to Hegbloom. For the sixth consecutive year, Ram was the official truck of the country music awards, which were presented at AT&T Stadium and which set a third Guinness record for most-attended live awards show with its audience of 70,000.